The Frugal Family Life: Red Gold Review & Giveaway! 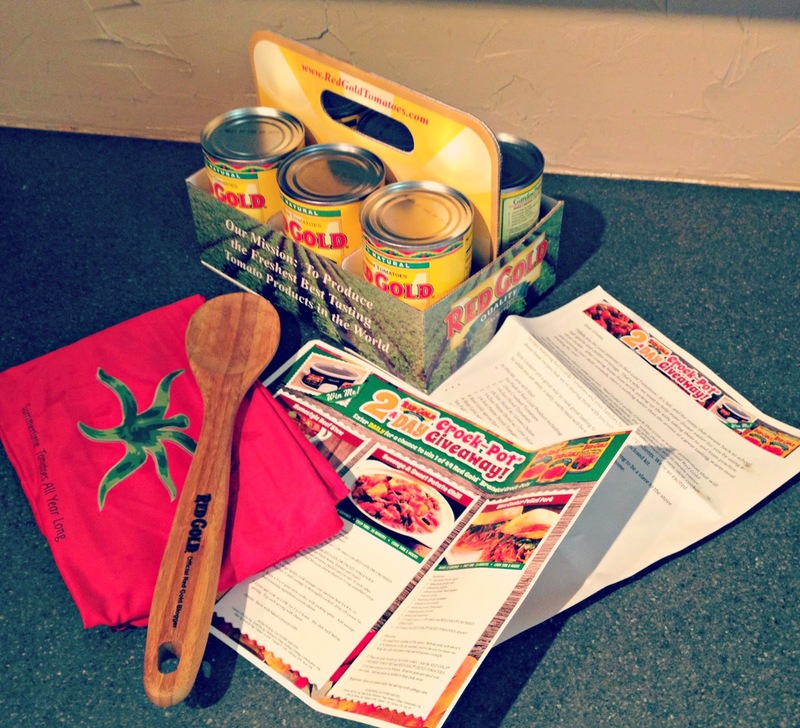 (Win a Crock Pot or a Red Gold Tomato Gift Pack)! Red Gold Review & Giveaway! 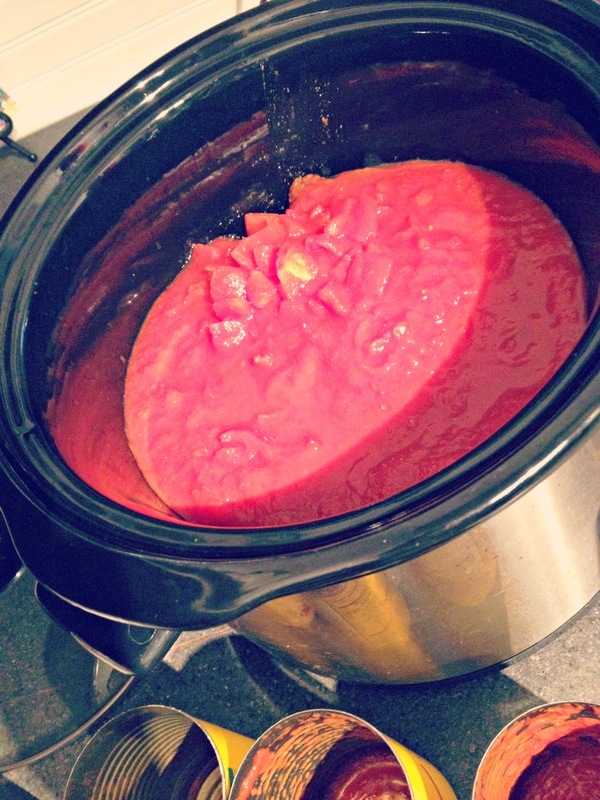 (Win a Crock Pot or a Red Gold Tomato Gift Pack)! I was recently contacted by Red Gold to review their tomato products and promote a giveaway they are currently doing on their facebook page! Red Gold is currently hosting a promotion on its Facebook fan page from September 17-October 8th! 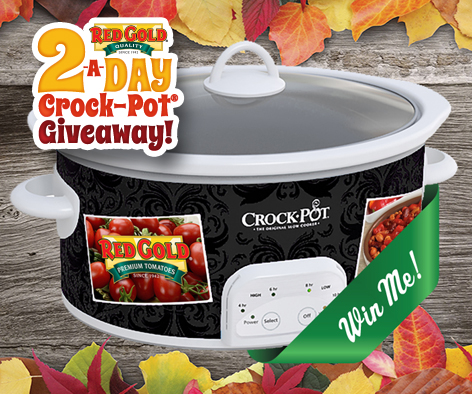 During this promotion they will give away two slow cookers a day for three weeks — that's 44 Crock-Pots! Just go to https://www.facebook.com/RedGold to fill out an entry form. Now, on to the review I promised. I was sent a Red Gold tomato pack which included 6 cans of Red Gold tomatoes, a Red Gold apron, a wooden spoon and 6 recipes. So far I’ve tried one of the recipes and I plan to try the others as soon as I get a chance. We decided the Slow Cooker Pulled Pork Sliders sounded good! Recipe is at the bottom of the post. 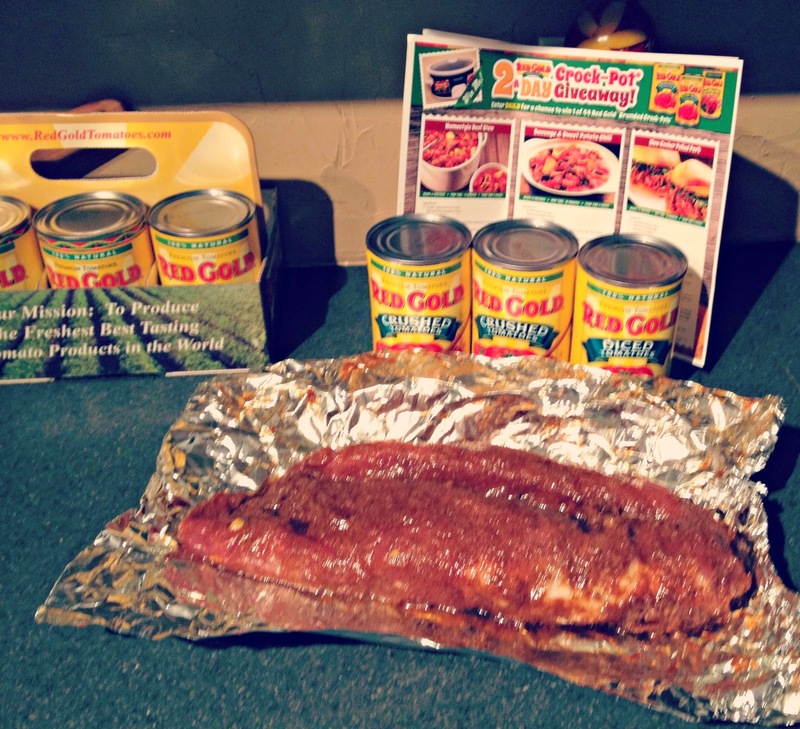 Here are a few pictures of the preparing and cooking process. The recipe turned out pretty well. My family was pleased and we ended up eating all of the pork—it also lasted us 3 meals which is GREAT for this family of 5! We definitely got our money’s worth out of it and even my girls loved the slider sandwiches! Red Gold has agreed to do a giveaway of a Red Gold tomato gift pack for our readers! So, one of our lucky readers will win a Red Gold tomato gift pack! All you have to do is comment on this blog post! One lucky reader will be randomly selected from the comments on September 30th. Once the winner is selected they will be contacted for contact information to be passed along to Red Gold so they can receive their gift pack! If you would like a chance to win, just leave a comment below saying why you would like to win and make sure to include your email address so I can contact you if you win!! In a small bowl combine all the spices. Rub the pork with about 6 to 8 tablespoons of the dry mixture; reserve the rest for future use. Wrap the pork with plastic and refrigerate overnight. Place the pork, fat side up, in a slow cooker. Add the RED GOLD®CRUSHED TOMATOES and RED GOLD® DICED TOMATOES. Cover and cook on low for 8 hours. 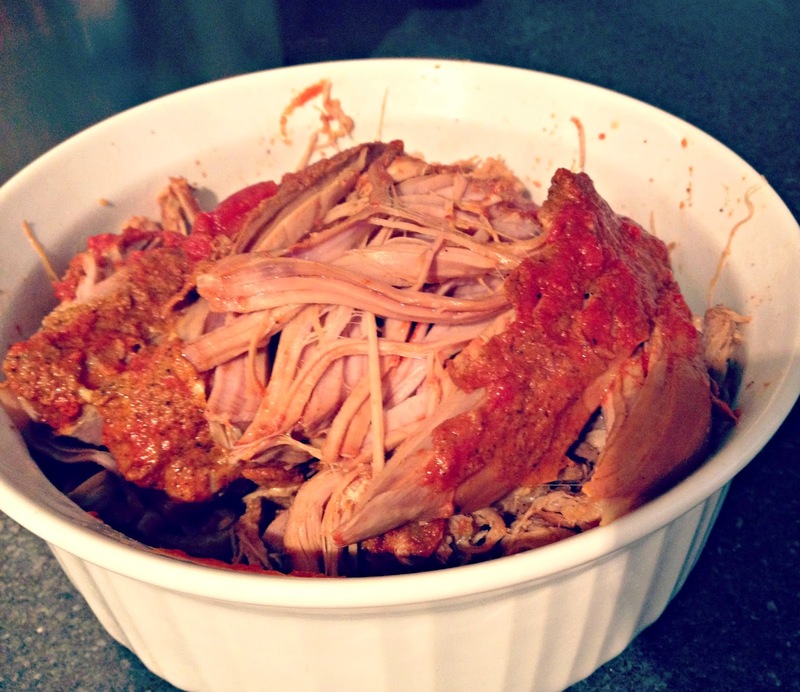 Remove pork and shred with two forks. Add pan juices as needed to keep pork moist. Suggestion: Serve on toasted slider bun and top with cabbage slaw. 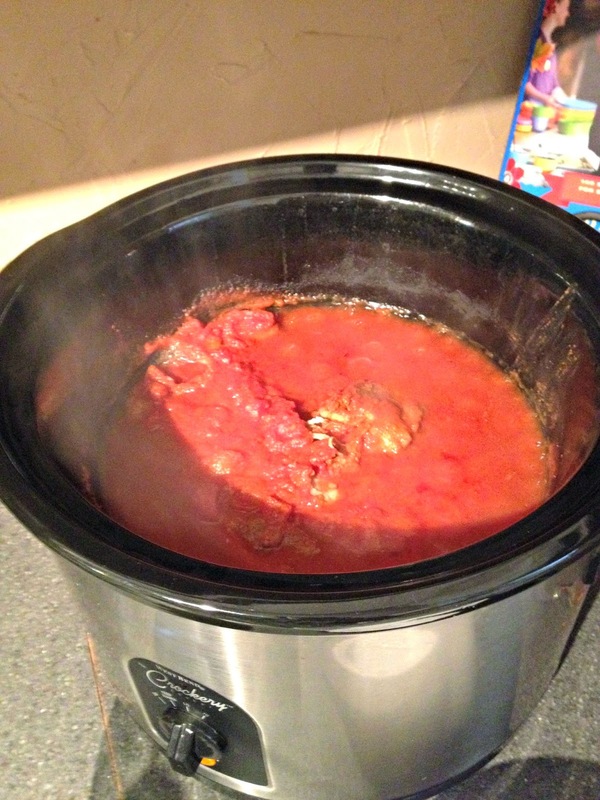 We do a lot of cooking in a crock pot, mostly stews and chilis. Our crock pot is probably 10 years old, so we are about due for a new one.